NFL owners are treating grown men like little kids while signaling that it's more important to maximize ratings than to combat racism. One of the biggest stories in sports this week has been NFL owners’ deliberations about a potential new policy to regulate player protests. One reported proposal calls for 15-yard penalties to be assessed to any player who doesn’t stand for the national anthem. Another suggestion would result in team fines when players don’t stand. Another would have teams set their own rules and enforce their own punishments. 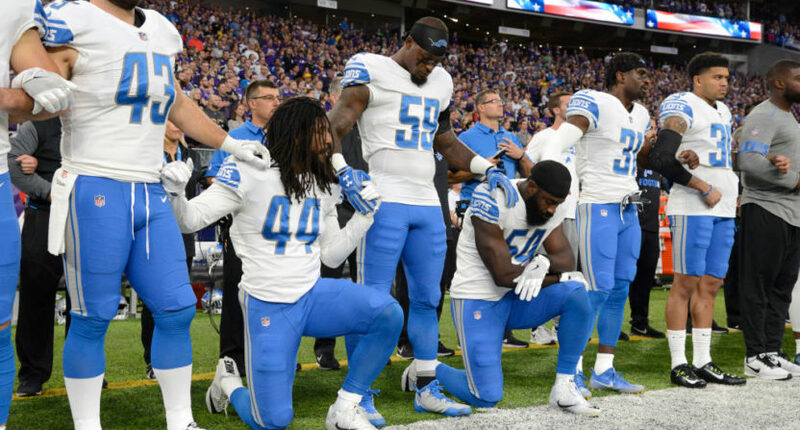 Now, multiple outlets report that owners will vote on a “compromise” in which players can either stay in the locker room during the national anthem or stand on the sideline but cannot kneel or otherwise protest. Anthem resolution is likely to be announced this afternoon, and it is expected to allow players to stay in the locker room during anthem and fine teams for any flag/anthem disrespect, per league source. We, however, humbly offer another suggestion: Let the players do what they want. If they want to stay in the locker room, great. If they want to stand for the anthem, cool. If they want to kneel while a song plays to call attention to police brutality and other instances of systemic racism, which create vast disparities in white and black wealth, income, education and incarceration rates… more power to them. But wait, you say, protests during the national anthem are hurting NFL ratings and therefore the league’s bottom line. Owners have to do something! But do they? Do they really have to do something? Do they have to proclaim that a few angry fans are more important than players’ right to express themselves? That anti-black racism in America is not something worth calling attention to? That grown men need to be told when they can and can’t make themselves heard? No, they do not. Instead of passing a paternalistic set of rules designed to silence players speaking up against something important, they could let these guys decide for themselves, like the adults that they are. They could signal that combatting racism is more important than maximizing ratings. They could do their part to make “land of the free” mean something. They won’t, but they could.